Natural horsemanship can be defined as, working with or training horses in a kind manner, which is consistent with a horse’s natural behavior, instincts and personality. Training horses starts with understanding how their minds work. You have to understand what is logical to the horse. The horse's mind does not work the same way as yours. They do not associate events or a sequence of actions in the same way we reason that things are related. To train a horse, therefore, you have to understand how horse logic works and base your training on that. Horses are prey animals. They are in an undesirable position in the food chain and they know it. Their eyes are on the outside of their heads so they can see danger coming from any direction. When we approach a horse, it has no way of knowing what our actual intent is. It can only observe our actions and make a decision that it is safe to stay put or safer to flee. Don Healy knows how horses think, act and react. He also knows that all horses are not the same, so he adjusts their training methods to allow the horse to progress at its own pace. But, one thing is always the same for all horses and that is the process he uses called "pressure and release". Whether you are looking to start a horse or modify an undesirable behavior, Don will work with you and your horse to form a working relationship based on mutual trust and respect. 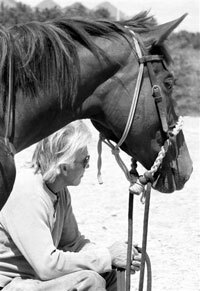 After looking through the website feel free to contact Don with any questions you may have regarding his training methods, to inquire about Don's clinics, or to check on his availability to work with your horse.